Title: ' Mappe Monde qui comprend les Nouvelles decouvertes faites jusqu'a ce jour'. An uncommon world map in two hemispheres with four cartouches that represent the crown, religion, conquest, and trade. Geographical features include a vast Terra Incognita in North America, a misshapen Japan, and New Guinea appended to Australia. Tasmania is depicted as a peninsula. The map is hand tinted in three colours and is in very good condition with no foxing, an original fold, and only a small repaired half inch tear at the bottom of the image. 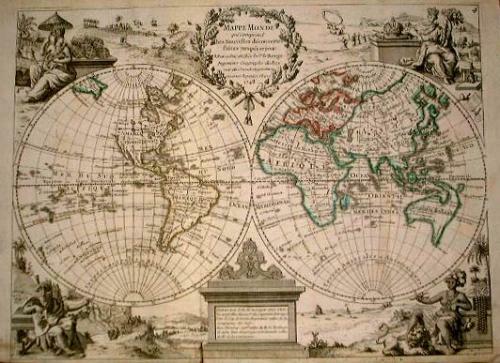 The map is printed on good quality paper and it is seldom seen on the market.